Do-It-Yourself with the DIY Fire Pit kit. Comes with Burner Assembly Kit and detailed instructions. All you need to buy is paver stones and lava rock. Whether you want a round, square or rectangular fire pit - you can buy the kit that's right for you. Click here to view the brochure. Spark's LBS Outdoor brings the cutting-edge look and design versatility of our indoor ﬁreplaces to your outdoor space. These innovative products will enhance any outdoor architectural feature or landscape design. Available from 24" to 96" inches. Click here to view the brochure. 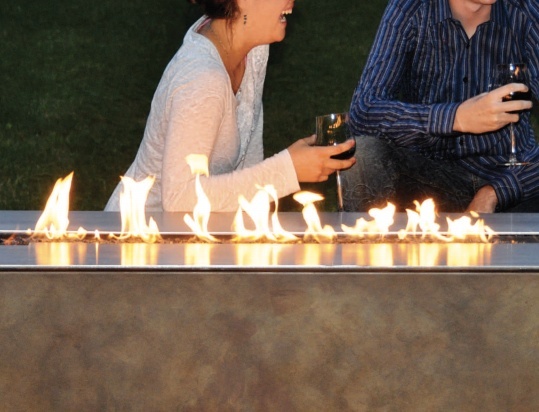 Create your own design around your fire pit using non-combustable material. Outdoor fir pits can be installed on top of wood decksor patios, with a 24" clearance to side walls. Allow for 7 foot clearance from the top of the fire pit to the ceiling. Choose from natural gas or propane. Click here to view the brochure.